It is a common skin disease which is characterized by thickened patches of inflamed, red skin. It is covered with thick, silvery scales. The elbows and knees are the common areas affected by psoriasis. It often appears in the same place on both sides of the body. The patches can range in size from smaller than a dime to larger than a hand. Normally, skin cells mature and shed after about a month. In psoriasis, the cell maturation speeds up, taking only three to four days. Because the lower layer of skin cells divides more rapidly than normal, dead cells accumulate in thicker patches on the skin’s outermost layer (called the epidermis). 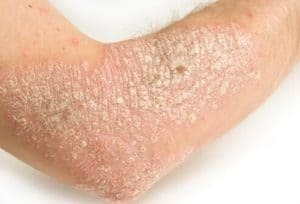 The underlying psoriasis cause is unknown. However, it can from generation to generation genetically inherited. Most researchers agree, that the immune system is somehow mistakenly triggered, which speeds up the growth cycle of skin cells. 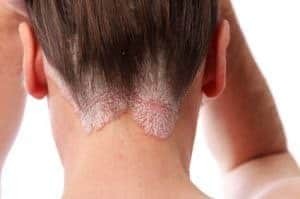 Psoriasis most commonly appears on the scalp, knees, elbows and torso. But psoriasis can develop anywhere, including the nails, palms.